Veterinary dermatologists are responsible for diagnosing and treating a wide variety of animal skin diseases and disorders. Veterinary dermatologists are veterinarians with advanced training in the treatment of animal skin diseases. The usual duties for a dermatologist include evaluating an animal before treatment, performing diagnostic tests, performing surgeries, operating specialized equipment, documenting cases in detail for medical records, and supervising veterinary technicians or other support staff. A critical skill for professionals in this field is the ability to perform diagnostic procedures such as skin exams, biopsies, skin scrapings, and cultures. By interpreting the results of these tests, a veterinary dermatologist can make a diagnosis and recommend a course of treatment to solve problems such as hair loss, parasitic infections, emerging cancers, and a variety of other related disorders of the skin, nails, and ears. Veterinary dermatologists may also be involved with teaching, performing and publishing scientific research, developing animal health products, or consulting on cases when an opinion is requested by an animal’s regular veterinarian. Those in academia will have a variety of additional duties that may include giving lectures, supervising lab work, supervising student researchers, and advising students and residents. Veterinary dermatologists in clinical practice may specialize in working with one particular species, though it is more common for a dermatologist to see a broader category of patients (i.e. small animals, large animals, exotics). Veterinary dermatologists may find employment in a variety of areas such as academia, veterinary hospitals, research or diagnostic laboratories, government agencies, and pharmaceutical companies. Veterinary dermatologists begin by completing their Doctor of Veterinary Medicine degree. As a licensed veterinarian, they can pursue a residency which provides additional specialty training in the field. To be eligible to take the board certification exam, a candidate must complete a one-year internship, then complete two additional years of residency, and publish at least one paper in a scientific journal. Upon passing the exam, a veterinarian will be granted diplomate status in the specialty of dermatology. There are approximately 235 active diplomates in the United States. Diplomates must complete continuing education credits each year to maintain their status. The American College of Veterinary Dermatology (ACVD) administers the certifying exam for veterinary dermatology in the United States. The ACVD also maintains a list of approved training programs which includes educational institutions such as Auburn University, Cornell University, North Carolina State University, Ohio State University, University of California at Davis, University of Montreal, University of Pennsylvania, University of Tennessee, University of Wisconsin, University of Guelph, and Michigan State University. Some dermatology and allergy hospitals are also listed as providers of approved residency programs. The European College of Veterinary Dermatology (ECVD) administers the board certification exam and oversees residency training programs in Europe. There are several professional organizations which accept members who are board-certified dermatologists or veterinarians with a strong interest in the field. The World Association of Veterinary Dermatology (WAVD) and the American Academy of Veterinary Dermatology (AAVD) are two such organizations. The Bureau of Labor Statistics (BLS) reported a median annual wage of $82,900 for all veterinarians in their 2010 salary survey. The lowest ten percent of all veterinarians earned less than $50,480 while the highest ten percent of all veterinarians earned more than $141,680. Board certified specialists would tend to earn top dollar on this scale of compensation, but the BLS does not provide specific salary data for each of the veterinary specialties. 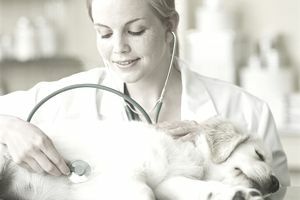 SalaryList.com reported that the average salary for veterinary dermatologists was $120,674 in 2012. The highest salary reported at the time of the survey was $224,640; the lowest salary reported at the time of the survey was $56,160. Obviously, compensation may vary widely based on each practitioner’s level of experience in the field, with established dermatologists tending to earn the larger salaries. The Bureau of Labor Statistics (BLS) does not separate the specialty of veterinary dermatology from data collected for all veterinarians, but it does project solid growth for the veterinary profession over the decade from 2010 to 2020. The BLS data show that the veterinary field will grow at a rate of 36 percent, much faster than the average rate for all professions. Those who can achieve board certification in dermatology should have no trouble finding a suitable position. The rigorous nature of the training programs and board certification exams ensure that only a limited number of professionals can achieve board certification each year. This limited supply should guarantee a strong demand for professionals in this veterinary specialty.